Smart social media managers know that a Facebook ‘Like’ doesn’t automatically equate to a fiercely loyal brand ambassador. Especially when the brand page runs repeated contests to bring in page ‘Likes’, and encourages behaviour like deleting Facebook friends to win free food. Burger King Norway’s recent Facebook stunt – designed to separate the loyal fan from the hungry passer-by – used the website Whopper Sellout to offer its 38,000 local Facebook fans the chance to claim a free Big Mac. 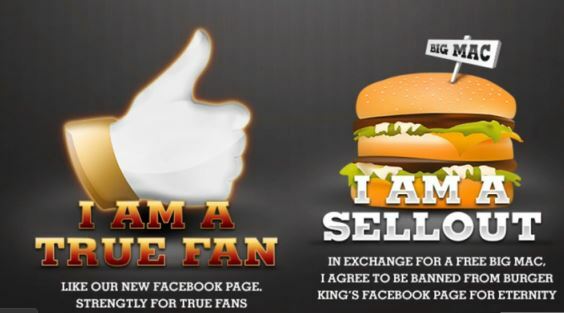 Those who clicked “I am a true fan” gained access to a new Facebook page exclusive to ‘true fans’, while those selecting the Big Mac were banned from the new page for life (and given a voucher for a Big Mac, along with a signed goodbye note), creating an VIP page for the brands loyal fans. Out of the 38,000 original fans, 8,000 chose to access the new page, rather than eat a free Big Mac. The campaign, by DIST Creative, was an interesting way to build an exclusive community of loyal fans, but I wonder if it was an effective way to judge loyalty. McDonalds could run a similar campaign tomorrow, and there’d be nothing to stop a person from being a member of both brands exclusive communities. Most people can spring for a Big Mac themselves, which makes the result of the campaign – a loss of 30,000 Facebook fans, who would rather eat a free rival burger than be a VIP Burger King fan – look a touch pathetic.